THE MAJORITY of staff at the Pinneys seafood factory in Annan walked through the factory gates for the final time last week. The official fish processing shifts ended last Friday, with only a small crew remaining on site to wind down operations. And the impending closure brought back many memories for one former employee, who still retains a world record from her time at the factory. Ecclefechan resident Mary Johnstone started working at Pinneys in 1984. She said: “I had helped the year before during the Christmas period and a close family friend told me they were hiring. 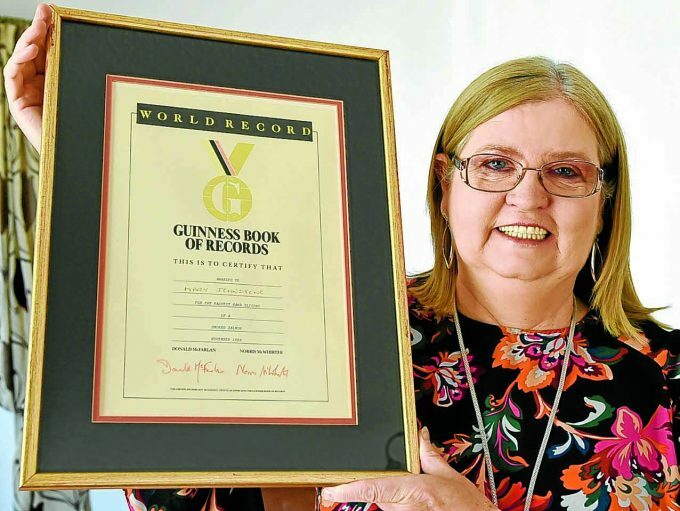 Four years later, and Mary found herself volunteering to take part in a world record attempt. She said: “The manager at the time made an announcement at a meeting I was at, saying Pinneys had been approached by the Guinness Book of Records because there had never been a record attempt for slicing smoked salmon. Mary was one of three Pinneys staff to make the trip and attempt to gain a place in the American version of the Guinness Book of Records. She explained: “We had to slice the salmon from top to tail as many times as we could in two minutes. “They had to be a certain thickness, and because Pinneys had recently started working with Marks and Spencer the slices had to meet Marks and Spencer standard. Speaking about the reaction to her world record, Mary said: “It was just fantastic, a cheer went up, everyone was hugging each other, we were so happy. Although others, including chef Gordon Ramsay, have attempted world records for salmon slicing, Mary’s particular record still stands after nearly 30 years. She left Pinneys in 2010 after 26 years at the factory, and now works at St James Smokehouse in Annan. Speaking about her memories of Pinneys, she said: “It gave me a good living, I worked my way up. “I’m still vexed that it is closing – my late husband worked at Chapelcross and I had a tear in my eye when the towers came down there, and with Pinneys it’s a similar feeling. “Those two industries gave us our lives, and I worry they won’t be there for our kids. “With Chapelcross and Pinneys closing it makes you wonder if anything good will happen to Annan again. “But I do think Pinneys gives you skills you can take elsewhere, and I know a lot of people have already managed to get jobs which is good.